Yes, if you are after a list of priorities en familia, it would be books before bros, as even the lowliest of paperbacks had its own casement, before us children ever even got a look in. Anyways, amidst my perusing the other day, I came across a book from my childhood, that I (shock) hadn’t got rid of. It was one of possibly a dozen or so of illustrated children’s books that were in squished into my TOP-TEN-FAVOURITE-BOOKS-TO-PRETEND. Numbered in amongst this illustrious collection were multiple Enid Bytons, Beatrix Potter, Lucy Locket (with her kleptomaniac pockets), Dr Foster went Gloucester, and The Mystery Beast from Ostergeest. 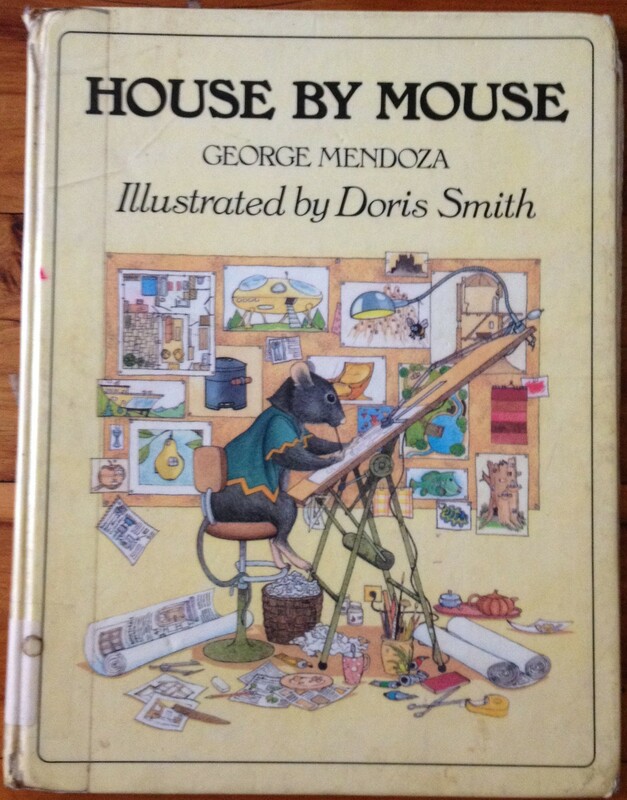 But my all-time favourite had to be House by Mouse, written by George Mendoza, and charmingly, if confusingly illustrated, by Doris Smith. 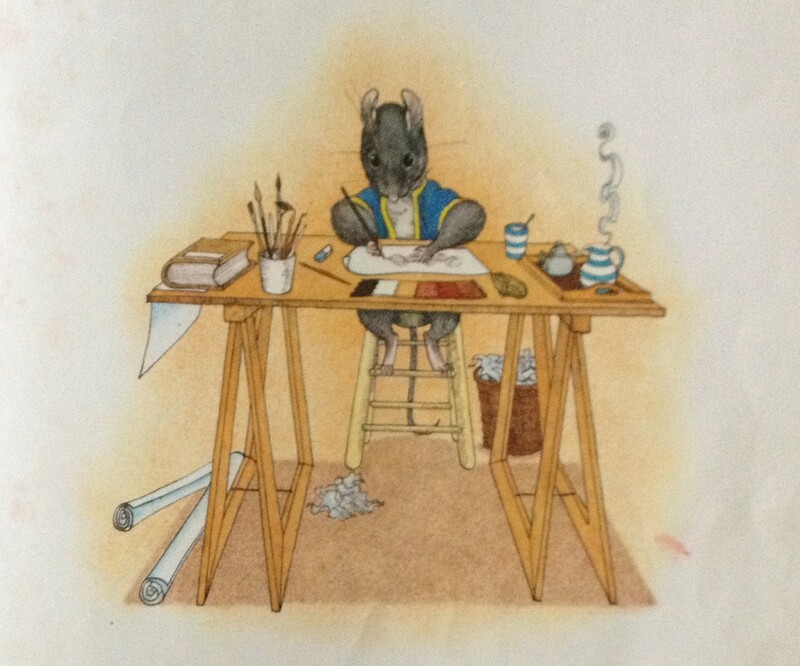 An A4-sized hardback book with detailed and colourful pages, it depicts the story of Henrietta, (the aforementioned mouse) who designs and builds houses for animals. 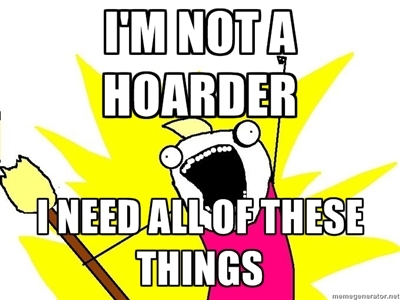 In other countries it was known as Need a House? Call Ms Mouse, which in 1981, was a rather striking blow for independent working females across the board. Possibly, being Australian, we’re less concerned with the gender, as opposed to the species of the structure-building expert…so House by Mouse it is. This was my MOST FAVOURITE EVER game of pretend – and the book, has been so loved and re-read, it is now held together by mostly aid of masking tape and sheer will-power. But as I was flicking through it, I realised I have never really ANALYSED or CLOSE READ this book – like EVER. Did my parents ever vet this book before turning it over to me? I don’t think so. And maybe things are different in a pseudo-zoological world, filled with anthropomorphized creatures, but there were some serious, and down-right disturbing things going on with Mouse and her allegedly built houses. 1. Henrietta is a mouse, who designs houses. She only designs them for animals, is apparently very sought after in the animal kingdom. According to ‘all the animals’ (which I am sure is more anecdotal hyperbole than actual evidence from a rated Likert response scale given to all the animals IN the Kingdom); Henrietta is the only mouse in the world who knows exactly how all animals specifically want to live. In short Henrietta is a genius. And also, it would appear, a little speciest. I mean what about people? Why not design dwellings for people too? Is there something wrong with us? 2. Also, Henrietta is apparently self-taught and unqualified, as I see no reference to any type of architectural, drawing, environmental landscaping or design qualifications. In a world of occupational health and safety, buildings that need to adhere to a rigorous earthquake code and all sorts of energy & greenhouse regulation, one wonders whether a self-taught mouse really has all that in-depth knowledge… It could definitely make one twitchy. BUT if they are happy doing it, (and they always seem to be smiling) then who are we to mess with the system? A hide-away for Fox to relax in after hard days of scheming. 5. From first glance, Henrietta seems like a typical architect, giving lots of orders, talking to ‘stakeholders’ and making unskilled labour do all the hard yards. So no different from real life there. But the illustrations tell an interesting story as well: why do none of her helpers have Personal Protective Equipment? What no hard hats or harnesses or safety equipment? 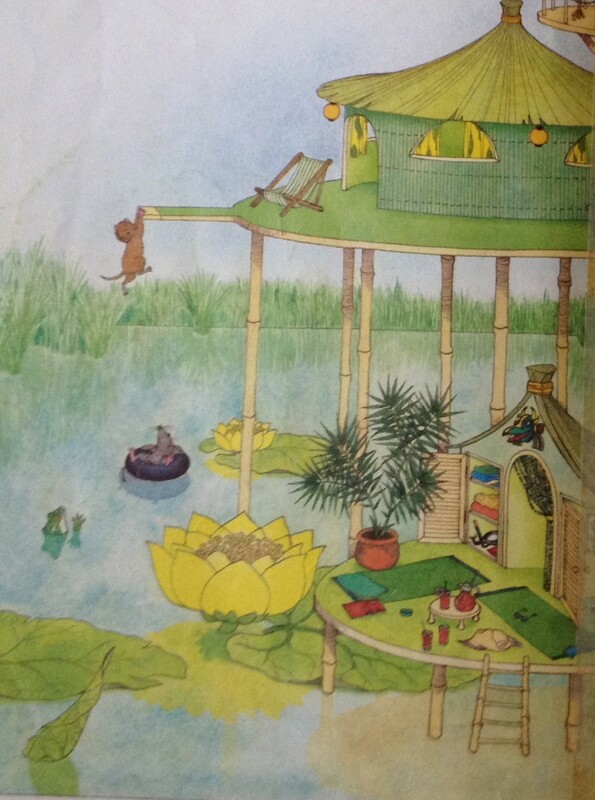 In one PARTICULARLY disturbing image, a ‘faithful helper’ is dangling dangerously from Frog’s bamboo diving board, whilst both Frog and Henrietta watch laughing from below! That helper does not look happy. WorkCover would have a fit. 6. Also, why is there no bathrooms in any of the houses, (Not even Henriettas), except for Pig, who (it has been scientifically proven), is one of the cleanest animals in the world? 7. There seems to be a rather rigid class system that is referenced subliminally. In the illustration of Pig’s house, there are badgers, working the gardens and carting about large statues of Pig. But has Henrietta built a house for them? Can they not afford her luxury prices? Are they simply one of the many working-poor animals that eke out their existence by catering to the very elite, unable to afford housing, renting ramshackle shoeboxes for exorbitant by-the-month payment with no security? 7.2 As an Adjunct to the previous point: Why is Henrietta, Henrietta, and everyone else just a capitalised version of their species? Why is Sea Trout not called, say Boris? or Lazy Cat not Captain Richmond….? Again, is this a concealed attempt to classify and grade certain types of animals – should we be concerned with these subliminal messages? 8. There is tiger skin complete with head in Pig’s bathroom. Which is not only terrifying, but causes one to wonder:Where did Henrietta or Pig get the Tiger Skin from? How did a mouse (or a pig for that matter) lure a TIGER into a situation, which resulted in its demise, and subsequent re-appropriation into floor decoration? And what does Pig do that ensures he is so fabulously wealthy? Is he from the Mob? Does his wealth come from ill-gotten gains? Is that where the tiger skin came from? i. The concept of: find out what you love to do, and then make a living out of it, doesn’t really hold water, because Henrietta loves to design houses, but still finds it WORK, and not an enjoyable or relaxing experience. ii. When do her faithful helpers ever get time off? Even on holiday, she drags them along with her to order about, make meals and collect firewood. iii. Why is there no consistent sizing? If those are accurate representations of trees, then Henrietta would be at least 6 feet tall; the lady bug comparatively, is ENORMOUS – if I had a ladybug that size climbing up my tent – I would totally freak. The axe is so small, how could the helper possible collect and chop up any firewood? I can’t even begin to comprehend the rest of the illustrations, with the spider that same size as the mouse (gahhh!) and the fox and the lizard that seem relationally proportionate. And now I am wondering – how has this seemingly innocuous children’s story, with its narrow world view and inaccurate (if not propoganda-ish) portrayal of the Animal Kingdom impacted on my own fundamental cognitive orientation? I return to.this post again and again and howl with laughter anew each time. I never get over the tiger skin in the pig’s bathroom. 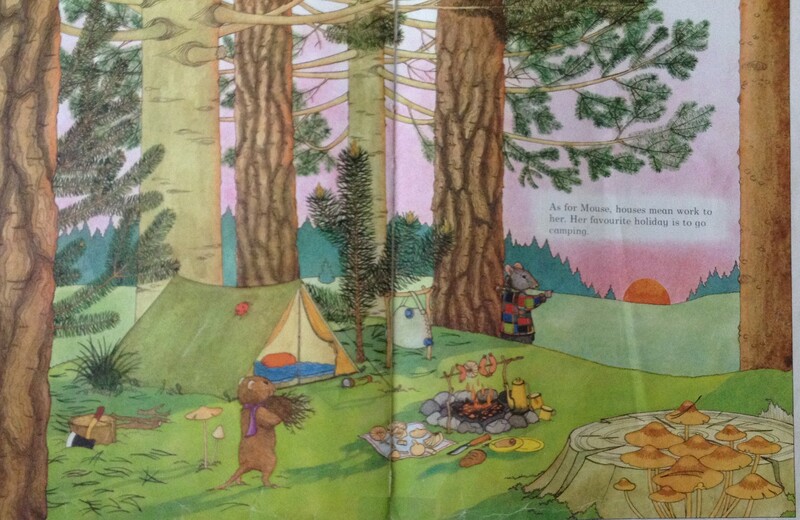 But seriously… I would have loved this book as a child, the same way I loved the Richard Scarry book’s – it was a lovely glimpse into imagined worlds that was somehow comforting because those worlds were so… Normal.